I often pride myself on being a Will Smith fanatic. Not fan…fanatic. If I hear that Will Smith is in a movie, tv show, talk show, or award show, I am right there showing my support. I will even happily admit that I love his music. It’s true. At one point I’ve owned all of his albums and I have listened to every single song he has ever released, and loved, well, most of them. In sixth grade, I had a majority of his songs up to that point memorized and still do. You may not think we fans of his music exist anymore, but we do. We are many, and often await his next album, if and when it ever shows up. Needless to say my opinion of the man is slightly biased, however. I’m ashamed to say I have not at this point actually seen the Bad Boys series. I’m sure it had to do with what I was and was not allowed to watch back in the day, but since it showed up on Netflix. I believed I owed it to Will Smith to get jiggy with it and finally watch Bad Boys. This film stars Will Smith as Mike Lawry and Martin Lawrence as Marcus Burnett, two cops and best friends that are a bit different than what you’d typically expect. They’re hip, and they don’t always follow the rules, but justice is always their number one priority. When $100 million worth of heroin is stolen from evidence, the boys have to track down the people responsible, and if it was all an inside job. Meanwhile, to secure witness testimony, they switch lives with each other, which causes a lot of complicated hilarity. It’s a Will Smith film as much as it is a Martin Lawrence film without doubt, but before anything, it’s a buddy cop action drama, and a pretty typical one at that. Yeah, I like what they were going for with the premise, and yeah Smith’s and Lawrence’s chemistry is off the charts, but for the most part, it feels way too much like a typical buddy cop film than what it was probably intending. I think part of that problem was the fact that it was released in 1995, and back then movies like this had some really cheesy soundtracks going on, which leads to cliché moments that just don’t fit in with our current level of expectations in film. That being said, the few expectations I did have for the film rarely actually satisfied me. I always figured that this would be one of the more action-oriented Will Smith films in almost an epic-degree. I was willing to forgive a lot of the cheesy melodramatic scenes strewn throughout if the violence was like, yeah, this is a guy’s guy movie. Yet, the action that it had, I felt wasn’t quite enough to be great. It had some good moments here and there, but I wasn’t overly impressed. The same goes for Will Smith’s humor. 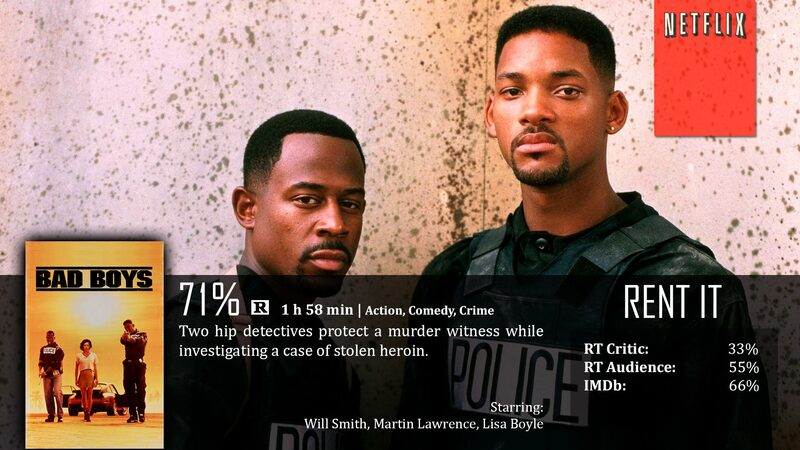 In the movie, Martin Lawrence seems to be the “funny man”, while Will Smith is a more…smooth-talking, serious guy. That’s okay, because I do like a majority of Will Smith’s acting range. However, in 1995, that wasn’t fully developed yet, and I wouldn’t dare say this character is one of his best. I could list of some of his all-time best movie characters. The one main thing that this movie has going for it was the premise of switching lives, which in turn is responsible for most of the humor, which indeed works. However, the story itself, or the case they are working on, I had a hard time really getting into it. That’s the plot though, and to not be so tuned in makes me a bit worried about the writing of the sequel. Then again, the sequel came out eight years later….plenty of time to get a good story out. Also, Bad Boys 3 is apparently in the works for 2015, which is 12 years after the second movie. Ought to be interesting…. Will Smith does a great job, and his chemistry with Martin Lawrence is pretty memorable. Bad Boys is still regarded as one of Will Smith’s better movies. I don’t really know why it’s regarded as one of his best, because for me, it wasn’t anything special, really. 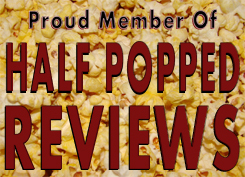 I didn’t care for the plot, was a little disappointed by the action, and there just wasn’t enough humor all around. Mike Lowrey: You know you drive almost slow enough to drive Miss Daisy.